What is the Integrated Accessibility Standard? The Integrated Accessibility Standard contains the four remaining accessibility standards: the employment standard, the information and communication standard, the transportation standard, and the built environment (public spaces) standard. Compliance obligations vary depending on the nature and size of the organization. The legislation differentiates between designated public sector organizations and private sector organizations. Designated public sector organizations include the Legislative Assembly, the Government of Ontario, municipalities and the organizations found in schedules 1 and 2 of the Customer Service Standard (see here). All other organizations are considered to be in the private sector. Employers with over 50 employees in Ontario are considered to be large organizations under the Integrated Accessibility Standard. Employers should note that this differs from the Customer Service Standard where a large organization was one with over 20 employees in Ontario. In determining whether an organization has 50 or more employees, every employee must be counted, i.e., all full-time, part-time and seasonal employees. If the number of employees fluctuates over the year, the employer must ensure that they are compliant if at any time they have over 50 employees. What do you need to know for January 1, 2014? There are upcoming obligations for large private sector organizations. Small private sector organizations do not have any upcoming compliance obligations for January 1, 2014. Accessibility Policy: Organizations must create an Accessibility Policy pertaining to their obligations under the Integrated Accessibility Standard. This policy is in addition to the Customer Service Standard Policy, as that policy only addressed the requirements under the Customer Service Standard. Accessibility Plan: Organizations must craft an Accessibility Plan which outlines how they intend to meet the requirements under the Integrated Accessibility Standard. The plan must be reviewed every 5 years. Since the compliance deadlines for the requirements under this standard are staggered, this is a useful tool to keep your organization on track. Self-Serve Kiosks: Organizations that have self-serve kiosks must have regard for accessibility features when designing, procuring or acquiring any self-serve kiosks. Organizations are not required to replace existing kiosks. This requirement only applies where new kiosks are being .procured or acquired. Web Accessibility: Organizations launching a new website or are making changes to an existing website must meet the accessibility criteria in the WCAG 2.0 Level A (please click here to access the WCAG). With respect to existing websites, this applies where the existing website is undergoing a “significant refresh”. Unfortunately this term is not defined in the legislation. Organizations should seek legal advice if they are making any website changes in the coming year in order to determine whether they must be compliant. From a customer service standpoint, a more accessible website will open up your organization to a wider audience and should be encouraged even if this requirement does not yet apply. By January 1, 2021, all websites and web content, regardless of whether it is new, must be compliant with the WCAG 2.0 Level AA (except for success criteria 1.2.4 pertaining to live captioning and success criteria 1.2.5 pertaining to pre-recorded audio descriptions). Large public sector organizations were required to prepare an Accessibility Policy and an Accessibility Plan by January 1, 2013. Small public sector organizations must comply with these requirements by January 1, 2014. Public sector organizations to which the transportation standard applies should note that there are some upcoming requirements under that standard. Those requirements have not been detailed in this blog. Please click here for more information. Training: Training must be provided to all employees, volunteers, persons who develop the organization’s policies and all independent contractors and other persons who provide goods and services on the organization’s behalf. The training must cover the requirements under the Integrated Accessibility Standard and the relevant provisions of the Ontario Human Rights Code. Employment Standard: Large public sector organizations must ensure that they are compliant with all remaining requirements under the Employment Standard (note that the requirement to prepare individualized emergency response information for employees with disabilities has been in force since January 1, 2012). Compliance with the Employment Standard may require significant changes to pre-exiting employment policies. Please visit our previous First Reference Talks blog post to learn more about these requirements. Web Accessibility: Large public sector organizations must also comply with the same web accessibility requirements as those for large private sector organizations outlined above. Feedback: Accessible formats and communication supports must be provided to people with disabilities upon request for the purpose of accessing any feedback processes that the organization has in place. Accessibility Policy: Small public sector organizations must create an accessibility policy (see the discussion above). Accessibility Plan: Small public sector organizations must create an accessibility plan (see the discussion above). Procuring or Acquiring Goods, Services or Facilities: When procuring or acquiring goods, services or facilities, the organization must incorporate accessibility features. Self-Service Kiosks: Similar to the requirement above, when designing or procuring self-serve kiosks, the organization must incorporate accessibility features. We are often approached by clients who are confused by the AODA and are uncertain of what is required of them and when. It is important for organizations to stay on top of their AODA obligations and deadlines. 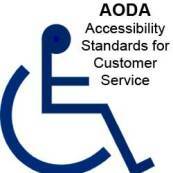 The Ministry is actively enforcing the AODA. Many businesses received notices of non-compliance this year for failure to comply with the Customer Service Standard. We should expect that the Ministry will be monitoring compliance with the Integrated Accessibility Standard in a similar manner. The Accessibility Plan is a valuable tool that organizations should use to keep track of the compliance deadlines. In your Accessibility Plan you should outline each requirement that applies to your organization, the compliance deadline, and your goals to meet the deadlines. Using the Accessibility Plan as a point of reference will help you to stay on top of the various rolling deadlines. Although small private sector organizations are not required to have an Accessibility Plan, we encourage these organizations to create one for this reason. Accessibility Standards PolicyPro is the only one of its kind offering all the resources you need to deal with the Accessibility for Ontarians with Disabilities Act (AODA) standards. The manual goes beyond covering what is required by law. It provides practical advice, tools and resources to help you meet your compliance requirements on time and with confidence.